This newly updated edition of Indiana Waste Solutions was a project undertaken by the Indiana Rural Community Assistance Program. The Rural Community Assistance Program (RCAP) is a nationwide nonprofit network dedicated to assisting rural communities with their water, wastewater, and solid waste needs. The Indiana Waste Solutions Toolkit is a helpful, free resource for the public and those in solid waste careers. This guide covers everything from State rules and regulations, composting, mulching, recycling, and open burning. 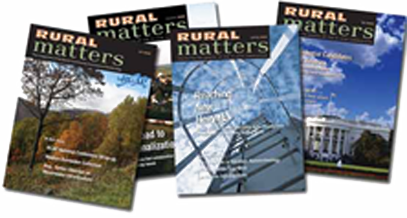 Rural Matters is sent free to subscribers by email or post-mail every month around the middle of the month. Rural Matters is the magazine of the RCAP national network. Rural Matters informs readers about the important environmental and infrastructure development issues facing rural communities today. It is a forum where those who live and work in America’s rural communities can give voice to new ideas and tackle challenges. Rural Matters is provided to communities and utilities where RCAP is actively engaged in assistance and training projects or where it has provided assistance in the past. The majority of readers are utility managers, operators and board members. It is also circulated to state and federal regulators and development staff. Total circulation is nearly 7,800. The magazine is published several times per year – from three to six issues. The contents of this 24-page full-color magazine are produced by national office staff, RCAP field staff, staff of RCAP’s funding agencies, and staff of related organizations. The magazine is edited by communications staff in the RCAP national office. Rural Matters shares information in a variety of directions – from a national perspective, such as news and developments from RCAP’s funders, and among field staff and communities, which share information about their work and expertise with each other, such as in case studies that show what works and what doesn’t in projects. A Drop of Knowledge (formerly the eBulletin ) is one of RCAP’s main communications resources. It is an electronic newsletter delivered via email that provides tools focusing on issues facing water and wastewater systems and small, rural communities. A Drop of Knowledge is designed for staff of water systems/utilities, board members and elected officials. It provides helpful tips, guides and resources on practical subjects and is written in plain English. The information it contains will help you make informed decisions to benefit your community, keep your system in compliance with Environmental Protection Agency regulations, and maintain water quality in the most proactive way. The newsletter provides information on the technical, managerial, financial and governance aspects of running a small water or wastewater system and will, on occasion, address security issues as its predecessor, the eBulletin, did.